Some people joke that only a nurse uses a sterile technique for opening a butter stick or inhales after every meal. However, this is only a joke. A bachelor's degree in nursing, sometimes a diploma is usually the first step towards starting a successful career. After the training, a hospital is the most prominent workplace for an aspiring nurse to start the first job. Fortunate for newly graduated nurses in the U.S, the country has many hospitals across states that value their nursing staff. Various hospitals offer nurses a host of benefits, outstanding working environment and support teams for them to feel appreciated. Most of the hospitals that provide incentives to nurses have won various awards for quality care by their nursing staff which spurs new nurses to work harder. Additionally, most of these hospitals offer career advancement and educational programs. Shared governance is a system of policies engaging individuals and groups in decision-making. Members of the group share responsibility and accountability. The best hospitals allow nurses to be part of the decision makers for them to give their concerns and views on how to improve or maintain high standards of nursing. The top hospitals offer numerous opportunities for nurses to upgrade their skills and explore new ones. When more nurses get educational opportunities and support to study, they come back to the facility with more knowledge that helps to improve the level of healthcare in the hospital. The medical field always presents something new to learn thus it is wise for hospitals to provide and support regular training for nurses. The best hospitals will even involve nurses in research projects. The top hospitals offer an excellent environment for new nurses to settle into their positions. It is within a properly structured setting that new graduates get long time exposure to different kinds of nursing. A nurse who settles into a healthy work environment find it easier to explore different nursing practices and determine the one that they excel in and energizes them to attend work. If they choose to enroll for Master’s program, it will be their best area to specialize. A good hospital invests in equipment with the latest technology for screening and treatment. It is a step that motivates nurses by making their work easier, more accurate and provides them an opportunity to keep up with technology developments in nursing. The leading hospitals allow members of their nursing to work on flexible shifts when they enroll for a new program or if they have highly engaging family obligations as a young baby. Some allow the nurses to leave early, work in the evenings or set up child care centers to take care of nurses' children while they are working for the patients. 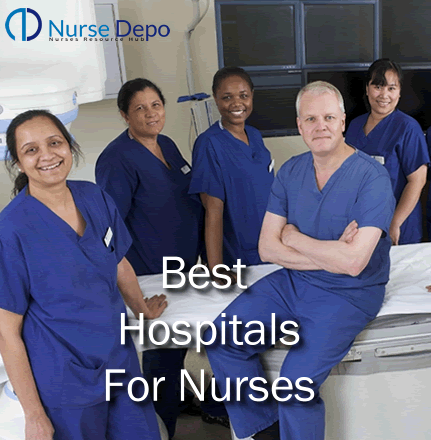 Want to know the aspects of the Best Hospital? Various hospitals offer nurses a host of benefits, outstanding working environment and support teams for them to feel appreciated. A hospital that recognizes the significant role by the nurses in healthcare gives them an opportunity for demonstrating their leadership and experience. Some of the ways include scheduling some nurses to lead department staff or nursing meetings, share nursing experiences and research on current medical topics. Assigning nurses to present educational sessions during peer learning sessions about subjects such as nursing procedures, patient care trends, responsibilities and hospital policies improves their morale as they feel someone recognizes their knowledge. Mentorship partnerships that pair senior nurses with new ones for support, sharing experiences and problem solving encourage mentoring partnership. The new nurses learn about nursing practice from their experienced colleagues, and in turn, they share new skills they learned at nursing school with their senior counterparts. Nurses in a hospital setting do not work alone. They collaborate with other health care professionals. The best hospitals are in their position because of creating a harmonious working relationship between various departments. At such hospitals, there are ways for nurses to understand other departments such pharmacies, laboratories, radiology and patient intake. They find it necessary to regularly invite members of all departments to attend nurse meetings or pass by at the start of a shift for introduction and discussing their departments. A mutually cooperative and supportive relationship for nurses goes a long way to motivate the nurses as they do not have clashes with other members of staff. A friendly, supportive and caring atmosphere makes nursing a more fulfilling career. When the nurses are satisfied, there quality of care to the patients is of a higher standard. As a nurse, it will be good for you to work in one of the top hospitals in catering for the welfare of nurses or and if you unlucky, ensure that the hospital you apply to join has great terms of service and a reputation for treating nurses right. The hospital in Seymour Indiana has been offering healthcare since 1911. Nurses working at the facility are highly satisfied that in 2013, the hospital had surpassed the satisfaction levels by National Database of Nursing Quality Indicators. In fact went beyond the standard for 3 consecutive years. In 2011, Scheck got Malcolm Baldrige National Quality Award for performance excellence. Organizers explained that it won the award because of an "empowered workforce." Additionally, the medical center recruitment policy consults the serving personnel and allows peer reviewing. Both have helped to control turnover levels. Current turnover is the lowest in the in two decades. Twice Magnet accreditation system has recognized Scheck Medical Center. Several publications have listed it as one of the top workplaces in Indiana State. John Hopkins is a Magnet-accredited hospital founded in 1889. It uses unit-based nurse committees to help in making a difference on various issues such as patient safety and performance enhancement. Nurses who decide to study for an MSN degree should have this hospital in Baltimore on their shortlist of potential health facilities to work. It even admits nursing students wishing to use their knowledge and skills overseas. John Hopkins has found its way into U.S News& World Report as one of the best nursing graduate schools. Furthermore, this publication gave the biomedical research and teaching facility an accolade of the best hospital in U.S for 21 successful years. A nurse founded this hospital that specializes in pediatrics in 1882. It is a Magnet-accredited hospital, and Healthcare Advisory Board has designated it as a "Destination Nursing" hospital. The Lurie Children's Hospital is one of the five facilities to earn the title around the country to get an award for an excellent working environment for the nurses. The hospital does not just win awards. It also honors the significant contributions of nurses through a quarterly national accolade, the DAISY Award. The award recognizes Registered Nurses and Advanced Practical Nurses in the U.S for providing outstanding work. The nurses at the Illinois-based pediatric hospital grants those it deems to have contributed an extraordinary care receive a "Nurse Exemplar" award. It offers eight of these awards. This children's hospital is another health care facility with excellent working conditions for nurses. Nursing staff will not just follow research. They get an opportunity to directly influence the research with some heading the studies while others take part in further projects. They even garner awards for the findings. The pediatric hospital system established in 1913 is Magnet-accredited. It runs on a shared governance structure that sees a proper representation of the nurses in organizational committees enabling them to make determinations that shape the decentralized departments. Another incentive by this non-profit facility is the support it offers to nurses wishing to change their professional direction by providing career guidance professionals and planning options. The support helps the nurses to substantiate the areas of specialization or become charge nurses, team leaders or preceptors. • Assistance for first-time homebuyers to the tune of $5,000. An Emerging Leaders program gives a head start to employees wishing to climb the career ladder. A twice Magnet-accredited hospital; West Virginia Hospitals incorporates Ruby Memorial Hospital as the flagship facility. The most appealing feature for nurses in this healthcare facility in Morgantown part of Virginia is the flexible shifts. Apart from getting an opportunity to work within the common 8-12 hours a day, staffers can choose regular or rotating shifts and four-week timetables. Nurses working over the weekend earn top compensation. Nurses may get recognition awards for making exceptional contributions to patients and medical care at the hospital and the community. Nurses serving here are free to contribute their view as they are part of shared decision-making system. It is a system that allows nursing personnel to influence matters such as staffing, education, and practice. West Virginia University Hospitals also offers new employees a smooth transition by taking them through a mentoring system. Founded in 1919, Houston Methodist Hospital is now a centerpiece for the Texas-wide Methodist Health System. It has a Magnet accreditation for proving that it is nurse friendly. In 2014, it jumped 21 places on the list of 100 best companies to work for. It has been on this Fortune list consecutively for nine years. The hospital offers incentives to retain the hospital nursing staff. Below are some the incentives for nurses. Houston Methodist Hospital offers nurses an involved role for them to team up with physicians to safeguard its exceptional patient care standards. These incentives have made nurses at the private acute care facility to become highly dedicated professionals who strive to offer best medical care to the patients and support to their families. Beacon Award bestowed to the medical-surgical unit was a sign to recognize the devotion by the nurses. The hospital has received the honor twice. Massachusetts General Hospital is the third oldest facility of its kind in the U.S. It began in 1811. It is the second best American hospital in U.S News &World Report has recognized it as the second best American hospital. The Minnesota-based clinic has for 11 straight years earned a spot on Fortune 100 best companies to work for. To feature on the list for this long show that the hospital is doing something right. Mayo Clinic is both a practice and a research group. It has employee centered-focus encouraging staffs who wish to increase their skill to undertake training by providing them with tuition support. Continuing Nursing Education Program gives nurses a chance for attending conferences that detail most recent research and practice developments.